The crew of the Mars500 simulated mission to the Red Planet have reached a key milestone. The six men, sealed since June inside steel containers representing a spacecraft, have "gone into orbit" at their destination. 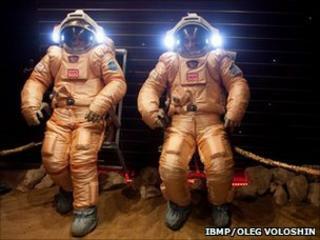 Three of the group will now "descend" to the planet, don real spacesuits and walk on the "surface" of Mars. In reality, this surface will just be the sandy floor of another module at the Moscow-based experiment. The Mars500 project is run by Russia's Institute of Biomedical Problems with the participation of the European Space Agency (Esa). It aims to investigate some of the psychological and physiological effects that humans might encounter on a long-duration spaceflight. "So far, I must say we've had no major problems," said Martin Zell, who heads up the Esa scientific programme on the International Space Station (ISS). "There is permanent monitoring, so we understand their health very well. We have a lot of data now on their mental state and on how their bodies are reacting. That's important because there is a link between the two," he told BBC News. The crew comprise three Russians, two EU citizens and a Chinese national. Alexander Smoleevskiy, Sukhrob Kamolov, Alexey Sitev, Diego Urbina, Romain Charles and Wang Yue all had to pass through a rigorous selection procedure to get on the programme, and their "departure" on the grounded spaceship last year drew wide international attention and curiosity. For eight months, the group has worked together inside the closed facility which has no windows and a total interior volume of about 550 cubic metres (19,423 cubic feet). The coming days will see Smoleevskiy, Urbina, and Wang enter a "descent module", from where they will have access to a further container that has been set up to look like the dusty terrain of Mars. The trio will put on the type of spacesuit worn by real cosmonauts and simulate the sort of geological investigations future astronauts might pursue on the Red Planet one day. Three sorties are planned, with the first outing due to take place on 14 February. A robot rover will assist the Mars walkers, and their activity will be overseen by Mission Control Moscow which normally deals with events on the ISS. "They will go on to the surface two at a time, with one man staying behind in the landing module," explained Dr Zell. "Working in their suits, they will have a drill to get below the surface; and they will do a virtual analysis of the samples the drill delivers to them. They will also take samples back to the module for further analysis." Although the Mars500 experiment has not been able to simulate the constant weightlessness of a genuine eight-month journey through space, it has been able to introduce one important realism - that of a time delay in the communications between the crew and their ground controllers outside the modules. Messages take 20 minutes to pass between the two ends of the link, similar to the lag radio messages travelling the great distance between Mars and Earth would come up against. This proved particularly testing last month when controllers deliberately - and without warning to the crew - cut the power to the modules. They even blew a small amount of smoke into the containers to give the men inside the sensation that they were dealing with a serious electrical failure. "They spent almost a day without energy," Dr Zell said. "They had to work through their emergency procedures and analyse the situation. They didn't panic and they remembered their training." The six men are due "back on Earth" in November. Mars500: Just like the real thing?